Spread an important message about early detection with every sip of your drink from this cute Personalized Breast Cancer Can Wrap. Our Hope and Love Personalized Can Wrap is perfect for insulating your canned beverage and encourages health and wellness to the people around you. Use this Personalized Breast Cancer Can Cooler at all of your Breast Cancer Awareness Fundraisers. 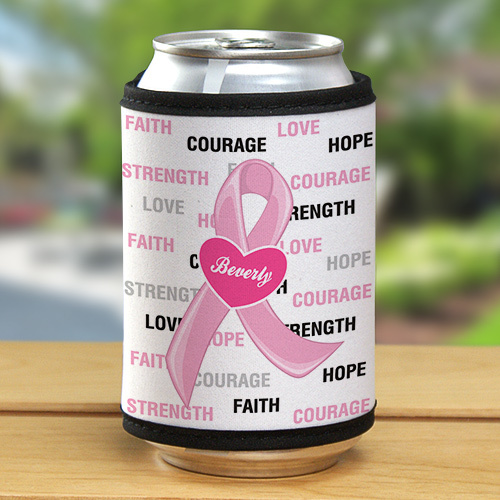 Your Custom Printed Breast Cancer Can Cooler measures 4" x 9 1/2" with velcro closure around your beverage bottle or can. October is National Breast Cancer Awareness Month. GiftsForYouNow.com has an extensive collection of breast cancer gifts that remind people to educate and promote awareness. For every Breast Cancer Awareness Gift purchased, GiftsForYouNow.com will donate a portion of the sales to help find the cure. Find unique gift for Grandma, Mom, Aunt, Sister or Best Friend with Personalized Gifts for Her. You are guaranteed to find the perfect gift for Birthdays, Weddings, Mother's Day, Grandparents Day and Christmas.